Six Minute Walk Test Guidelines Have Changed! Links to these documents are below and are also posted for members in the AACVPR Regulatory & Legislative Resources section of the AACVPR web site which contains extremely helpful and informative resources. As the final Medicare policy states, coverage of cardiac rehabilitation for beneficiaries with stable, chronic heart failure was effective for dates of service on and after February 18, 2014. This was previously discussed in the AACVPR Reimbursement Update on February 19, 2014. The implementation date is August 18, 2014. This means that all WPS must have completed changes to their claims processing software so that appropriate heart failure diagnoses (ICD-9 codes) are not denied. For CR programs that received denials for CR services provided to heart failure patients as of February 18th or later, re-submission after August 18th will most likely be necessary for reimbursement. Please work with your billing departments to be sure inappropriate denials are tracked and corrected. 2. NYHA class II-IV symptoms despite being on optimal heart failure therapy for at least 6 weeks. Are an AACVPR member? They have provided members with excellent webinars and FAQs to help programs interpret appropriate HF candidates for CR, based on the above eligibility criteria. This will continue to be discussed in depth at a heart failure session at the AACVPR Annual Conference in Denver: "How to Implement a Heart Failure Rehabilitation Program" - Randal J. Thomas, MD, MS, FAACVPR; Ray Squires, PhD, MAACVPR, Steven Keteyian, PhD, FAACVPR; Karen Lui, RN, MS, MAACVPR, on September 5, 2014 from 8:00 am - 9:30 am. For more information on how to register, please click here. CR Program staff, in conjunction with CR medical directors and referring physicians, should develop department policies that are consistent with the Medicare qualifying criteria with the goal of enrolling patients who will benefit from CR and are appropriately eligible. Some CR programs have been enrolling HF patients in CR since the effective date with successful Medicare reimbursement using diagnosis (ICD-9) code 428.22 (chronic systolic heart failure). You are advised to work with your billing dept. to find the most descriptive and appropriate ICD-9 code for each patient, given that patient's clinical diagnosis. It would be best practice to utilize the patient's medical record/Plan of Care to clearly document all the elements/conditions that qualify this patient for CR. The next Heartland Conference will be March 28-29th, 2014 at La Vista Conference Center in La Vista, NE. We will update the conference details as they become available. 1. AACVPR is urging all PR programs strongly to please review the Pulmonary Rehab toolkit and present to your financial department to adjust charges for G0424. PR programs cannot continue to offer services when they are only being reimbursed for $39. This is our own fault and we have the power to fix it. If you have any questions or you need help convincing your CFO, please contact Jane Knipper. 2. The AACVPR will be offering a Certified Cardiac Rehab Professional Certification exam next year at the National conference. See the AACVPR website for more information. 3. The AACVPR conference is in Denver Sept. 4-6, 2014. 4. Day on the Hill is March 13 & 14, 2014. We will continue to lobby about S.382, the technical correction to allow NPP’s to supervise rehab. 5. The 5th Edition of the the Guidelines for Cardiac Rehab are out. Everyone should have this in their department says Karen Lui. 6. We will have an opening for President Elect this year. Please consider the position and let Claire know if you have any questions. 7. AACVPR urged all rehab programs to join the CR and PR national AACVPR registry. Many sessions at the conference urged tracking outcomes. Our programs will become value based with the coming healthcare changes and we need to prove our worth! At the Northwest meeting, some departments mentioned having issues with the registry. Please let AACVPR know. Give them an opportunity to improve what is a work in progress. 8. AACVPR has a new initiative to support the state affiliates and their leadership. They have formed regional groups and Iowa is with Wisconsin, Minnesota and Missouri and the other one I think is Kansas. An AACVPR volunteer will coordinate a conference call 4/yr for us to network. This is a great opportunity as Wisconsin was the affiliate of the year and they have a strong organization so we can learn great things from them. Additionally, AACVPR will sponsor a leadership conference yearly in Chicago and will foot the bill for a hotel room for each affiliate (Pres and Pres elect can go). This year it will be in June, but they do not have a set date as yet. a. Outcomes have to be presented? b. Know your cost per case in rehab. You made to know that to negotiate with insurance companies. c. We need the ability for predictive modeling of outcomes with fixed costs. We need a moneyball guy. For example, does a late referral increase our cost and more. An empty hospital will be better than a hospital with full beds because we will get cost per member per month from payers. d. When patients come into the hospital we will need to: Assess risk, implement longitudinal care, and develop network of care providers. This is where they predict homehealth will increase and our programs can make a difference. 10. G0424 will likely change to a new APC. Jane Knipper is following this and will let us know when there are changes. 11. We are hoping S382 can get pushed through the senate. Many senators have not signed on. Both Iowa senators are signed on. The other states were urged to launch serious campaigns to get it done! 12. Big news! In June of this year CMS accepted a formal request for CHF to be a covered diagnosis. In December, CMS is expected to post a proposed National coverage determination with a public comment period. Karen Lui seemed very positive about the possibility that this could become affective in Spring 2014. 13. Lisa (Moeller), ARNP DNP with Dr. Sundaram’s office has started a local chapter of the PCNA (Preventative Cardiovascular Nurses Association) and is encouraging healthcare professionals (nurses, exercise physiologists, dieticians, etc) to join and support a local chapter. Meetings will be held twice a year. Benefits include: webinars, CEU opportunities, local networking, and patient educational tools. For more information, contact Erika Leonard at Allen Cardiac Rehab at 235-3911 or go to www.pcna.net and sign up under the Cedar Valley chapter. Held at the Pocahontas Community Hospital, with 26 people attending!! It was a great day of networking and great to have so many people come. A big thank you to Clarie Shannon for presenting us with information from the annual meeting and a copy of her balance assessment and exercises. Thank you too Jean Cipperly for informing us on some new statistics on diets and the use of fats making diets more successful. Discussion about the amount everyone charges for each session of CR and PR. With higher prices it is difficult as we can miss some people that can not afford the co-pay but we also have to look at do we want to loose our whole program. This year the Day on the Hill will be March 13 &14th with the big issue being Dr. supervision. Please send any issues you have to Claire. Claire touched on the Physician in proximate distance of CR and told us there really was no change. The 5th addition of CR guidelines is out and can be ordered through AACVPR. IACPR is in need of a president elect. Clarie talked about the responsibilities and how rewarding it has been for her. There are only 4 meetings with 3 being held by teleconference and the other meeting at the Heartland Conference. We talked about the Registry and many voiced the problems they have had. Claire stressed that we need programs to join as we need outcomes. With Obama Care we will need to prove that we are cost effective. We talked about the nutrition survey programs use. Many use the Rate your Plate as it is easy and free. You can google it. We also talked about certification. Claire did mention that now once you complete your application they will no longer be sending things back for you to fix. If things are not done completely as they instruct you, you will not get certified. Jean than shared some information that she had gotten at an AADE webinar; Healthy fats, Heart Disease and Type 2 Diabetes. She reviewed how the world’s top 12 health problems have changed from 1990 to 2010. Heart disease and stroke were 4th and 5th and now have moved up to 1st and 3rd. We all chuckled at the top risk factor in 1990 being low body weight and were reminded that this is world wide (in 2010 it was 8th). In 2010 High blood pressure, smoking and alcohol are the top three with inactivity now on the charts at #10. Modified fat diets (decreasing saturated fats with unsaturated fats) have a better effect on major CV risk factors than reduced fat diets. Other points made were that no diet is better than the other and we need to individualize our plans and help our patients find what diet works for them and encourage them. Most people plateau in weight loss at 6 months and after that they don’t loose much, try help them learn to maintain. Pre-diabetics are more successful at loosing weight and we need to try help them than. More saturated fats will also increase insulin resistance. Monounsaturated fats will help boost the HDL some. It is more important to be fit than thin we were reminded. Discussion about changes in health care coming with Obama Care, and that CR might be used on CHF pts. to help keep them out of the hospital, and/or there might be CR Home Health programs. There are some new plans for pts being discharged from the hospital called “See you in 7”. It has been shown that for every day a pt. is home and there is no contact with healthcare their attendance to CR decreases by 1% and their ER visits increase. There is hope that CHF will be a covered diagnosis for CR. WATCH EMAILS, is could happen as early as spring 2014. There was discussion about what programs were doing for competencies and how that sometimes is difficult for the one person department. We talked about referrals and how to keep clinic, ER’s, Home Care personnel informed so if a person gets missed they might catch it and make the referral. Mary Brandt RN, Coordinator of Pocahontas Community Hospital Cardiac rehab. Tuesday, April 16th in Independence at the Okoboji grill. Deb Recker from Independence coordinated this one. We had 13 in attendance. Many had attended the Heartland conference so we rehashed for the other members the high points. All Heartland attendees were complimentary of the pertinent information shared at the conference. 1. I shared handouts on the staff competencies that we use. A discussion took place on how departments complete their competencies. Some do a skills day and other do them monthly with their staff meetings. 2. All departments have had a Takosubo patients and we shared our experiences. 3. We discussed how each department is seeing CHF patients. Some filter them into Phase II with a stable angina dx (mindful that it is truly angina), others incorporate them into their Phase III with a free consult to start. 4. We discussed billing two sessions in one day and what scenarios this will work in such as the long intake process on the first day. 5. We shared how we manage tobacco cessation. Some departments have RT to help and others do it on their own. We all agreed that we do not have the expertise that the presenter at the conference has. 6. Attendees were encouraged to contact Senator Harkin and lobby for S.382. 7. Claire let the group know that there is a BOD position open on IACPR. 8. Participants that are not IACPR members were strongly encouraged to join the organization. 9. Claire shared information on the new AACVPR membership option. Our next meeting will be in mid- October and will be organized by Erika Leonard from Allen Memorial. Thank you to Nancy Steingreaber and Skiff Medical Center in Newton for hosting, and to Claire Shannon (IACPR President) for driving all the way from West Union to attend our meeting. · Rocky Mountain affiliate is disbanding due to lack of interest from its members. This highlights the importance of IACPR members becoming involved in the state association – we would hate for this to happen to us! · Claire reminded us that we are still looking for a President-elect for IACPR. Contact Claire C.Shannon@palmerlutheran.org or Susan flacksk@ihs.org for information about IACPR positions. · All Pulmonary Rehab programs should have worked with their revenue/billing departments by now to determine an appropriate amount to charge for PR services. If you are not familiar with the Pulmonary Rehab Toolkit, please check it out on the AACVPR website www.aacvpr.org. You may also contact Janie Knipper with questions at jane-knipper@uiowa.edu. · Discussed the Cardiac Rehab Registry. Several programs are currently enrolled and/or using the Registry, which is an excellent tool to assist with outcomes. It also helps you “compare” your outcomes with others to help determine where to focus your improvement initiatives. · Claire summarized a few of her favorite breakouts from the national conference. · Nationally, <20% of eligible patients participate in Cardiac Rehab. Nebraska has the highest participation at 53%; Iowa is 2nd at 46%. One topic that was discussed in the group involved monitoring/non-monitoring patients and “mixing” various diagnoses for rehab. Several programs were hi-lighted at the AACVPR conference who telemetry monitor their patients infrequently or not at all; we’re encouraged to use risk stratification to determine our patient care. Reminder: “monitoring” to CMS doesn’t necessarily mean “telemetry” – it refers to all monitoring techniques (pulse ox, HR, BP, etc). Both codes (93797 – non-monitored CR session and 93798 – monitored CR session) are reimbursed the same amount. Claire is currently non-monitoring patients in her program, so feel free to contact her if you want more information. Claire presented information about Motivational Interviewing with the group, and we all had time to practice. *Claire shared a handout that she has found useful – see attachment. The next meeting of the IACPR SE Quadrant is scheduled for Tues, Apr 23 at 10am, hosted by Renee Edgar in Oskaloosa. Leadership: Looking for a President elect. Job Description handout. North Carolina exceptional affiliate increased Physician involvement, improved finances of their org. legislation to bill for Ex Phys. license. Rocky Mountain (3states) folded due to lack of leadership. PR Tool kit: Contact Janie Knipper if you have taken the tool kit to your financial department to realign you charges for G0424. Contact Janie if you need help. Mean program length 13 weeks. Do not foresee that Registry will be a requirement for certification. Pulmonary Registry coming: Next June. Possible to be early adopter and pay only $50. Nutrition: What is the right diet? DASH, Very Low fat vegan, Mediterranean, The New American Plate, “Expect different strokes for different folks.” “The plan that works is the plan that is followed.” “Nutrition counseling to get the right fit and get support. Key Messages on Physical Activity: 1. Its not just for wt. control. 2. Can be 10-15 min blocks. 3. Limit TV/Screen time. 4. Find ways to add small bits of movement throughout the day. Extreme Endurance Exercise: There are 6 heart attacks each year during marations and 4 are fatal. Is more better? 14 deaths last year during triathlons – mean age 43. 11male – 3female. 13 of deaths were in swimming part of race. Location of death is usually during last quarter of event so after 20 miles in marathon. 50% happen at last mile. .54 deaths per 100,000 participants. Possible presentation for Heartland conference. Cardiac Rehab referrals: 19% eligible medicare patients currently participate in rehab. 53% in Nebraska (#1), 46% Iowa (#3). Too many not attending, dropping out, and don’t continue compliance. Research tells us that the maximum outcome is achieved at 38 weeks. To modify: enhance self-efficacy, increase long term adherence, (maintenance programs) increase accessibility (modify hours for those that work, increase program capacity with open gym model, maximize outcomes, reduce costs. Innovation in Rehab model: Goal to get patient into rehab within 5-7 days. Mark Lui: Think out of the box. Our core business is changing behavior. Participants knowledge that they can change behavior. His rec: 1. Take off monitors. 2. Individual does active warm-up and cool-down on own. 3. Open gym model. 4. Could use heart rate monitors. 5. Patients self record data. 6. Perceived exertion and enjoyment. 7. Self prescribed exercise by session 10-18. 8. Motivational interviewing. 5 to thrive: Emotional Well Being, Smoking cessation, Healthy nutrition, medication adherence, exercise and physical activity. Evaluate 1st visit, pt drive ship, help set goals. Coach every session, revisit goals, exploring successes, and failures. We reviewed Legislative and Regulatory Issues presented by Karen Lui at the National conference. Erika Leonard from Allen Hospital in Waterloo brought flyer encouraging nurses to join newly formed local PCNA chapter coordinated by Lisa Moellers NP from Cedar Valley Medical clinic in Waterloo. IACPR membership: Many of you have forgotten to renew your membership or are not a current member of IACPR. I urge you to remedy this soon. We need paid members in order to continue to be a strong, viable, financially sound affiliate. The next meeting is tentatively set for Tuesday, April 23rd in Waterloo. The Allen Hospital program will pick a meeting place. PocahontasCommunityHospital. We started about 9:30 am with 16 people in attendance. Susan Flack gave us interesting information about the AACVPR day at the hill. She enlightened us on the upcoming bills and the interpretation of them. She gave us nice background information and the need for a call to action. Our rehabs undercharge and are under utilized, but it is very cost effective and there is lots of evidenced based information. We discussed briefly about the AACVPR registry and Susan made a good point. We can think our programs are the best, but if we don’t compare it to anything how do we know they are good and could it be better. A nice discussion was targeted to teaching and health coaching, with several ideas going around. A few people had been to the health coaching classes and thought it was very helpful. We need to focus on the pts. goals not ours. Sometimes they are so overwhelmed they can’t think of anything. We need to be understanding and compassionate with our pts. and help them see what they can do. PR and CR need to document progression. A light lunch was served and than a tour of the PCH cardiac rehab department was given for those who could stay. Of course our discussion continued through lunch and after. Thank you to Sherrilyn Nikkel and Pella Regional Hospital for hosting the SE Quadrant IACPR meeting on Tuesday, May 8, 2012. The next meeting of the IACPR SE Quadrant is scheduled for Tues, Sept 18, 2012 with site and time TBD. Watch your email and check the IACPR website for details. Allen Hospital, Waterloo: Annual Heart Walk. They are involved in Heart Aware. They participate in health fairs, and do cholesterol checks. Central Community Hospital, Elkader: During heart month, they go into schools to present on heart health. Other ideas from other northeast Iowa CR’s: Go Red Friday contests and raise money for donations to AHA, wearing red hair extensions on Go Red day, articles on patients published in papers, Cardiac Rehab Christmas party inviting all participants from previous year, Heart Risk Appraisal that includes Framingham questionnaire, Cholesterol, Glucose, Sleep apnea questionnaire, blood pressure, BMI, activity level and then results reviewed with participant by RN rehab staff. The Southwest Regional IACPR meeting was held on September 29, 2011, at 10:00 AM at MontgomeryCountyMemorialHospital in Red Oak. 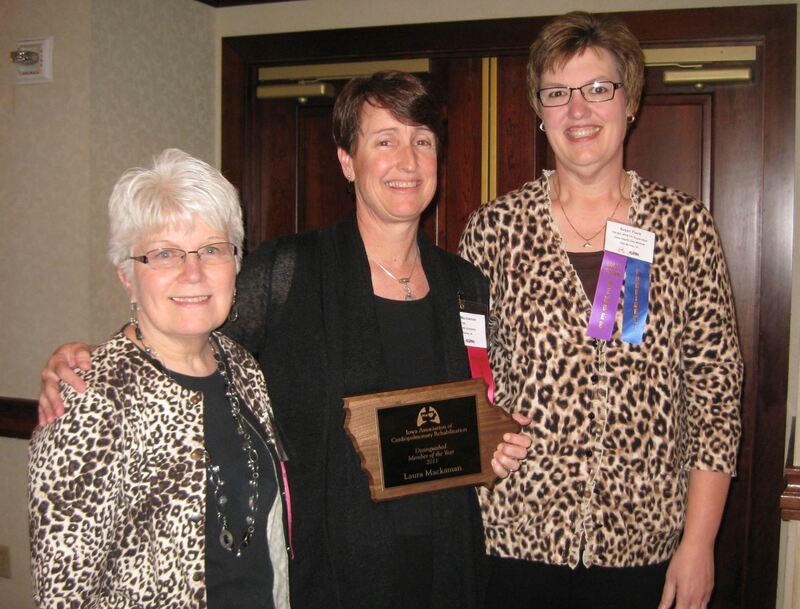 Special guest was IACPR President, Susan Flack, who had recently attended the AACVPR Annual Meeting. She reported on several topics of interest from the meeting including the upcoming AACVPR Outcomes Registry project, Supervising Physicians, and the possibility of cardiac and pulmonary rehab services being a part of a bundled payment for a hospitalization instead of getting paid per session as it is now. Benefits of membership to IACPR and AACVPR were reviewed. Discussion was held about how and when to hold southwest regional meetings. It was recommended to try to meet at least twice a year and that the best attendance would require hospitals in the center of the region to host most often. It was agreed that it would be beneficial to have the president or a board member who had attended the national meeting come and give a report at the fall meeting. The attendees took a tour of the Cardiopulmonary Rehab Department, which was followed with lunch. Peggy Dunbar is planning to host the next meeting in Atlantic, possibly in February. I sent the info below to 3 rehabs that were hoping to attend, but could not make it that day. In addition to networking and getting to know each other, I reviewed some of the information acquired from the National conference. Susan Flack unable to attend. a. Listen until you don’t exist. a. ‘Bottom line, findings strongly support a role for muscle strength in determining the physiological capacity to perform activities of daily living. From a clinical perspective, our results suggest that interventions designed to lessen physical disability in CHF patients should consider improving muscle strength as one of their goals.” Resistance/strength training should be part of CR/PR programs. 3. Sleep Apnea: CPAP can help CHF patients diagnosed with OSA. Must have titration study for CPAP pressure. 4. National Registry Update for CR and PR discussed. AACVPR site recommended for further details. 5. It sounds like NE rehabs are running into the insurances that have high co-pays. 6. Most NE rehabs have had LVAD patients in the past year. Policy and Procedures discussed. 7. Most NE rehabs doing some type of Phase III and charging $5 per session. The rest of the time we ate and visited informally. The consensus was that we would like to continue to do this every six months, Spring and Fall. Thank you to Leslie Heemsbergen and OttumwaRegionalHealthCenter for hosting the SE Quadrant IACPR meeting on Thursday, Oct 13, 2011. Attendees introduced themselves and gave a bit of background on their rehab and association experience. Current IACPR President Susan Flack presented highlights from the recent AACVPR Annual Meeting in Anaheim. ü In a breakout given by Karen Lui, EOCs (Episodes of Care) were discussed. The Affordable Care Act includes provisions for bundled payments, clearing the way for more “global fees”. This could significantly impact reimbursement for our services, as cardiac rehab could be “bundled” with the cardiac event (MI, CABG, etc). Instead of billing for each session of care, CMS would make a global payment to the medical institution, intended to cover virtually all services received. There is certain to be more communication on this topic from the AACVPR, but in the meantime, Karen encouraged us to streamline our care and make our programs as efficient as possible, as the current billing practices may disappear. ü CMS has proposed to cut reimbursement for hospital-based pulmonary rehabilitation from $63 per session (national average) to $38 (national average). Actual Iowa reimbursement would be lower. Unfortunately, this decision was reached due to hospital “charges” being too low. CMS uses a formula to determine payments, and the data reported to them by hospitals regarding charges for pulmonary rehab resulted in this decline in payment. Pulmonary Rehab programs are encouraged to discuss session charge rates with their Business or Reimbursement Office to make sure they are submitting appropriate charge amounts. In addition, there was discussion about the importance of “patient progression” while participating in Cardiac Rehab. Although CMS allows up to 36 sessions over 36 weeks, the average patient does not require this many sessions. There has been at least one instance where CMS visited a Cardiac Rehab program (in our area) and reviewed medical records to check on patient progression. The hospital was forced to reimburse CMS a substantial amount of money because patients had continued to participate in Cardiac Rehab after plateauing with their exercise. Cardiac Rehab needs to be individualized for each patient: this includes education as well as MET level (functional) goals. Patients are to be discharged when they are no longer showing progression. The next meeting of the IACPR SE Quadrant is scheduled for Tues, May 8, 2012 in Pella. Details will be posted at a later date. CEUs through AACPR/Academy Medical—AACVPR webinars are more expensive than Academy Medical. Academy Medical educational programs are $49 through IACPR membership. State surveys of hospitals—Surveyors were looking for locked up patient records, outdated medications or syringes, MSDS sheets on hand sanitizer gel. Resistance training—One program starts resistance training 4 to 5 weeks into Cardiac Rehab with 1,3,5, and 10 pound weights for 5 minutes using 10 reps. Patient education—Some programs are using Krames “Living with Heart Disease”. Others are using Active Partnership which includes a CD (cost of $20). Program administration issues—Pulmonary Rehab participants need documentation of “face to face” contact with their physician. One program pages their medical director for documentation of response time. Patient outcomes—Some programs are using Duke Activity Status Index (DASI), Depression forms PH Q2 and Q9, Montana Outcomes. Patient knowledge assessment—American Heart Association diet quiz (dated 1996). Staff competencies—Programs shared examples of their staff competencies which included ACLS protocols, ACLS meds, rhythm strips, department-specific emergency protocols. CommunityHospital will host the next NW district meeting sometime in early spring 2012. Your help is needed TODAY to protect cardiac and pulmonary rehab programs! · AACVPR requests that cardiopulmonary rehab professionals, referring physicians, hospital administrators IMMEDIATELY contact their U.S. Senators to urge them to Co-sponsor a bill that will correct the unintended legislative language which restricts physician supervision of cardiac and pulmonary rehab programs by nurse practitioners, physician assistants and clinical nurse practitioners. · S.382 was co-introduced by Senators Schumer (D-NY) and Crapo (R-ID) on February 26, 2013. · This bill is NO COST because physician supervision of cardiac and pulmonary rehab is not billable to Medicare. · This bill is NON PARTISAN. Access to care for Medicare beneficiaries is not a Republican or Democratic issue. · This bill CORRECTS THE BLOCK TO ACCESS TO CARE FOR MEDICARE BENEFICIARIES for services they have a right to receive under public law 110-275. COPY the provided letter template by clicking here, ADD your signature and institution, CLICK here to access Senator Harkin's contact form and complete all required information, PASTE letter into the comment section of the website contact or body of e-mail message to the staff person, SEND. FAX THIS LETTER TO SENATOR HARKIN’S OFFICE. COPY the letter template; ADD your signature and institution, PRINT and FAX. 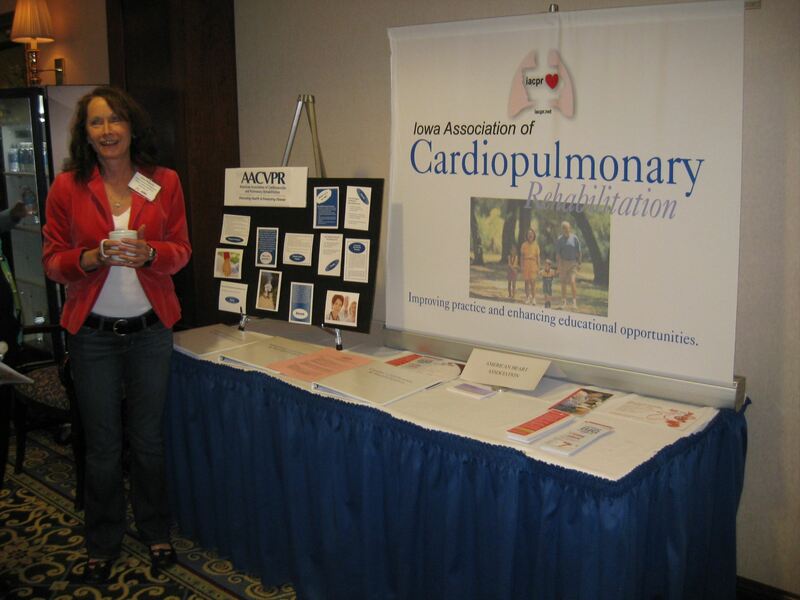 The Annual Heartland Cardiopulmonary Rehab Conference will be held April 12-13, 2013 at the West Des Moines Marriott in West Des Moines, Iowa. We will update the information as it becomes available. The Medicare reimbursement for pulmonary rehabilitation for patients with COPD was reduced on January 1, 2012 from approximately $68.00 per session to $37.00 per session. Therefore, it is imperative that ALL pulmonary rehab programs work with their billing departments to determine if you are charging an appropriate amount for G0424 (Pulmonary Rehab for patients with COPD). The toolkit provides a step-by-step approach to do this. I am happy to help anyone with this if you need clarification or assistance. It is important that your hospital adjust your charge for G0424 as soon as possible so your charge is consistent with what is outlined in the toolkit. If we don’t do this, programs are at risk of closing because of the low reimbursement rate for G0424 of $37.00 per session. If we act now, the earliest we may see an improvement in the reimbursement rate is 2014. So, please don’t delay in evaluating your current charge for G0424. That being said, the codes that are listed in the toolkit are examples of codes that could POTENTIALLY be bundled into the G0424 code. In other words, if we didn’t have G0424 to bill COPD patients for pulmonary rehab services, we would be charging for each individual service we provide, and the codes listed in the toolkit are examples of what services we might be charging. Therefore, every possible service we provide to COPD patients should be considered when determining the amount you charge for G0424. Your natural reaction as you read the toolkit might be: Should we be charging non-COPD patients for all of the services listed in the toolkit? Not necessarily. Charges reflecting the services we are providing to our non-COPD patients may vary depending on the MAC jurisdiction in which we work. Your MAC may not allow use of some of the codes. For example, oximetry is typically bundled into G0237, G0238, and/or G0239; therefore you would not bill separately for that service. The same is true for the six minute walk test. Reminder: the PFT criteria for non-COPD patients participating in Pulmonary Rehab is as follows: FVC, FEV1, OR DLCO < 60% predicted. This may be different than what you used in the past if you are not working in Iowa. However, the J5 MAC Medical Director has specifically instructed us to follow this PFT criteria for non-COPD patients. If you have any questions about whether or not you should use a particular code, you should check with your Compliance Office, contact your MAC liaison for your jurisdiction (that is me for MAC J5), or do both. Pulmonary Rehab no longer has to use Modifier 59 when billing for more than one of the non- COPD “G” codes on the same day. So, for example, if G0238 and G0239 were charged on the same visit, you don’t have to use Modifier 59. For more information and to download a brochure, see the Continuing Education page. CMS has clarified a coding requirement for cardiac rehabilitation services that was not included in the Cardiac Rehabilitation Change Request 6850, published May 21, 2010. Change requests are specific billing instructions sent to providers. Your billing department would have received these change requests for both cardiac and pulmonary rehabilitation. The change request for pulmonary rehabilitation is # 6823, published May 7, 2010. When billing for more than one session of cardiac rehabilitation per day, modifier â€œ-59â€ must be used. This is because two CR sessions in a day are considered different patient encounters. The policy for Modifier -59 is found in the CMS publication, MLN Matters SE0715 (CLICK HERE to access). This means whenever any combination of CPT/HCPCS 93798 and 93797 are provided for two CR sessions in one day, proper billing requires use of the modifier. Failure to use the modifier -59 when submitting two charges for one day has resulted in denial of payment for some CR programs. If you are a member of AACVPR, you will receive the most up-to-date reimbursement information. Please consider joining now! Photos from the first annual Heartland Conference in Des Moines, 2011. If you have photos you'd like to share, email them to Candy Steele or Leah Lenz. Be sure to identify the people in your photos! Claire Shannon-Klann, IACPR President-elect, greets visitors at the IACPR informational booth.